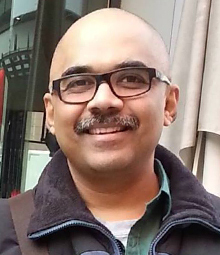 Baradwaj Rangan is a Chemical Engineer from BITS, Pilani. After his graduation, he moved to Advertising. He worked as copywriter at J Walter Thompson, writing ad copy for multinationals like Citibank, Reynolds and PepsiCo. He then joined the Masters programme (on a full scholarship) in Advertising at Marquette University, Milwaukee. He was a Research Assistant for two years, designing and testing Internet/Intranet-related projects, especially an Intranet system for the manufacturing conglomerate Allen Bradley/Rockwell International. He was also International Representative, College of Communication, in the year 1996-97. He did an internship at M&I Trust & Investment Management, Milwaukee, where he documented and developed target customer profiles using MicroVision, and was the main liaison between the Marketing Department and an external research agency. He also built marketing plans for their financial products. The white-dominated nature of the advertising industry and the Y2K panic paved the way for another career change, this time into software. Baradwaj joined Greenbrier & Russel, Milwaukee, in 1998, as a Consultant Technical Writer and Programmer. In 2000, he joined Motorola, in Schaumburg, as Software Development Engineer. He later became Business Analyst, handling requirements for Enet, a global intranet system linking Motorola offices worldwide. Baradwaj returned to India in 2002 to explore the possibilities of being a writer. He began as a columnist and film critic for The Economic Times – Madras Plus, and then joined The New Sunday Express. In 2011, he joined the Hindu, where he is now Film Critic and Senior Deputy Editor. Baradwaj won the National Award (Swarna Kamal) for Best Film Critic in 2005. His writings on cinema, music, art, books, travel and humour have been published in various magazines like Open, Tehelka, Biblio, Outlook and The Caravan. He has co-written the screenplay for the Tamil rom-com, Kadhal 2 Kalyanam. He has written dialogue and narratives for the dance dramas Krishna and Meghadootam. He teaches a course on cinema at the Asian College of Journalism, Chennai. Baradwaj has contributed to various anthologies, the most recent being an essay in Subramaniyapuram: The Tamil Film in English Translation. His first book, Conversations with Mani Ratnam, was published by Penguin in 2012. His second book, Dispatches From the Wall Corner, was published by Westland in 2014.